You will love getting your own copy of the Homemade Dessert Recipes Newsletter. It's my special gift to everyone who loves delicious desserts and enjoys reading Grandma's old fashioned recipes. I'll be updating and growing this site with more of Grandma's old fashioned recipes and practical cooking hints, plus items of interest and nostalgia. By receiving your FREE newsletter from time to time, you won't miss a single thing. 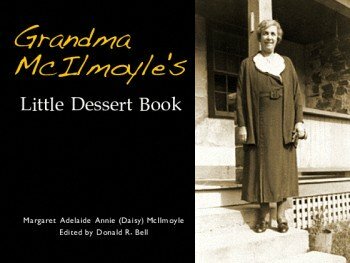 Along with your Newsletter, also receive instant access to a PDF copy of Grandma McIlmoyle's Little Dessert Book! Enjoy reading great recipes from the early 1900s written in Grandma's own handwriting. Have fun trying the recipes and getting to taste desserts that families enjoyed eating over a century ago! It's a wonderful experience. After subscribing, you'll be given a special link so you can instantly download your PDF Ebook and its historical recipes. Thank you so much for the little dessert recipe book! It is delightful! Seeing the recipes written in your Grandma's own handwriting makes it seem so friendly! Your email address is totally secure, and it'll never be shared with anyone else. I promise! And you can easily UNsubscribe at any time using a link at the bottom of every newsletter. It takes only a moment to sign up, and your subscription is absolutely FREE. I understand that you will use my information to send me my periodic Newsletter and instant access to a PDF copy of Grandma McIlmoyle's Little Dessert Book. Please Note: You must be able to receive a confirmation email before you can receive my newsletters. If you use a "Challenge-Response" type email service or message filtering, you need to whitelist my site address to make sure that your email server can accept email from my domain: homemade-dessert-recipes.com. I just wanted to let you know how much I enjoy getting your newsletter in my inbox! I LOVE recipes...and especially the old fashioned ones. They mean the most since they are made with the one ingredient that cannot be bought in the grocery aisles — love! Thank you so much for such a wonderful site!